Bob Dylan recently celebrated his 75th birthday. 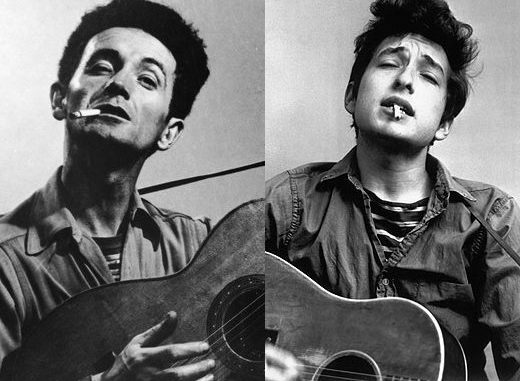 As one of the latter 20th century’s most important songwriters’, it seems apropos to re-visit the biopic Bound for Glory, a rendering of Dylan’s greatest inspiration, singer-songwriter- professional hobo and activist Woody Guthrie, covering his early days. Released on Blu-ray through Twilight Time, Bound for Glory was directed by an iconoclast, about an iconoclast. Director Hal Ashby, one of the ultimate outsiders who flourished when Hollywood purposely reached out to “counter-culture” artists, had already made his name with such atypical fare as Harold & Maude, The Last Detail and Shampoo, when he chose to dive into the very traditional genre of the biography. 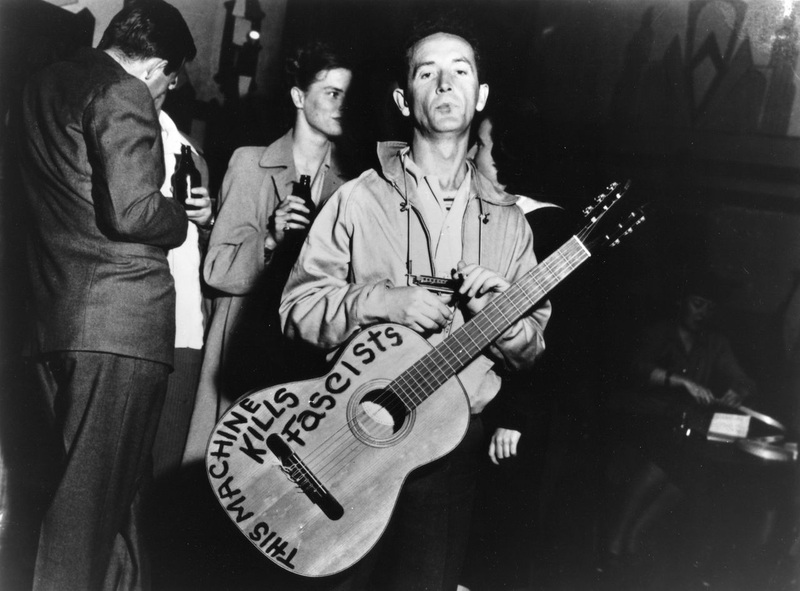 But under the idiosyncratic eye of Ashby, the source material, based on Woody Guthrie’s own autobiography, became a meditation on the dust bowl, the Great Depression, isolationism and ego. Besides the period, the latter elements share a commonality with the director’s best work. Bound for Glory follows Guthrie’s formative years in the mid 1930s from an anomic sign painter barely able to keep his Pampa, Texas family afloat, to the voice of the downtrodden farmworkers in the early 1940s. From the start it’s clear he has an unusual energy that people seem naturally drawn to. He has no interest in earning a living, instead spending his time picking his guitar and entertaining locals with his folksy wisdom and simple outlook. His ability to look through the surface and understand the inner workings of man casts him as a soothsayer. Struggling with whatever inner demons he’s tormented by and bitter from his wife’s haranguing, he pins a note on the icebox and travels west to California. Guthrie learns about the hard knocks of life thumbing rides, jumping boxcars and mostly; walking. He’s dismayed to discover that California is so loaded down with Oklahoma immigrants that the police charge a $50 entrance fee to cross the border, and decides to exist on the very edge of society, happy for a hand-out or a warm bunk to cuddle in. With little or no thought (outwardly anyway) to his family back home, he uses his charms to gain the interest of a myriad women. He finally lands in a work camp and borrows a guitar to busk for change. Before long, he’s gained the attention of a local radio disc jockey, a composite character of several people the real Guthrie knew, here named Ozark Bule (a vibrant and endearing Ronny Cox) who spends his free time singing to farmworkers and admonishing them to go Union. Finally discovering an outlet for his musical talents and activism, Guthrie makes it himself onto the radio, where advertisers are more interested in his family friendly folk tunes and storytelling charms, and less in his penchant for Workers’ Rights. His far left politics get him in hot water, as the more enlightened Guthrie becomes, the more difficult he is to “rein in.” He forces the hand of the radio station General Manager, and is fired just when he’s become successful. An agent gets him an audition at the glamorous Ambassador Hotel, but he leaves in a huff after the nightclub owners toy with the idea of posing him against a bale of hay. From there, Guthrie waves Los Angeles “goodbye,” deciding New York is his next destination. In reality, New York was where Guthrie’s career really took off, and his music and personality made him a lightning rod for the Communist movement, folk music and stardom. But Ashby is less interested in some of the more dramatic and downright salacious aspects of his later years (to be fair, Guthrie’s autobiography only goes as far as his entrance into the Big Apple) and more focused on his insufferable personality and simple yet confounding priorities. When the film was in development, every A-list actor was interested in playing the role, but Ashby landed on David Carradine, fresh from his success as Kwai Chang Kane, the mixed race Shaolin monk who drifts through the American West, in TV’s Kung Fu. It was a bit of genius casting, as the actor carries that same sense of disconnect and existential loss in both roles. 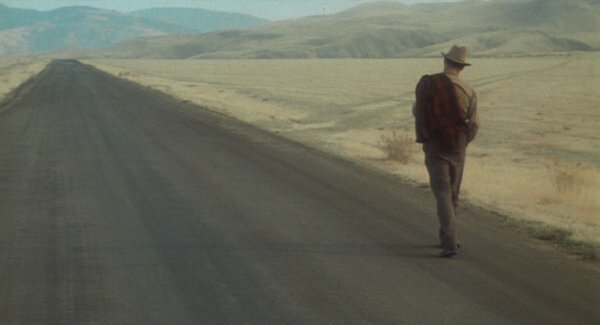 Cinematographer Haskell Wexler won an Oscar for his powerful images; a dusty grittiness that perfectly emulates the period and the landscapes of rural Texas to California’s Central Valley. A Dust storm that descends on the small town of Pampa, Texas is so realistically rendered; a virtual 100 foot wall of dust moving across the screen, that it’s an impressive effect even by today’s standards. But the challenge for the film is mostly the disagreeable protagonist. He’s so out of touch with everyone and thing around him, physically abusing his wife, quick to anger and even quicker to just walk away, that it takes a keen interest in the times and the legacy of Guthrie to keep the viewer engaged. As usual, Twilight Time’s Blu-ray is a beautiful transfer that sorely lacks extras. It may not be the most impressive film, but Bound for Glory’s stunning visuals and curious storytelling will hold sway for those with more than a passing interest in the man who forged a musical legacy. 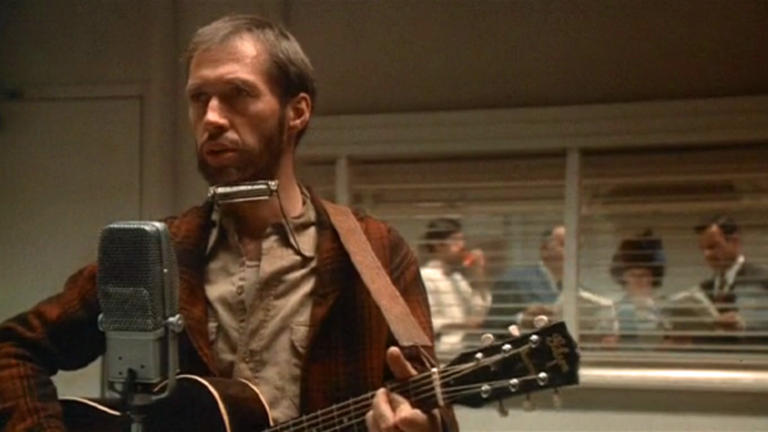 Bound for Glory is available as a limited edition blu-ray exclusively through Twilight Time.